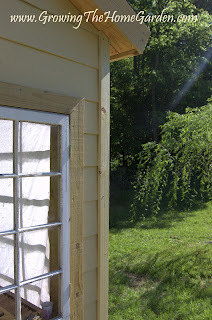 Every day that I get a few minutes to work on the garden shed I get a little closer to finished. Of course I'm still not close enough for my tastes but I'll keep plugging away at it and eventually it will get completed. A couple weeks ago I managed to add the trim to the corners on the outside of the shed and yesterday I did some gap sealing in the eaves. I used a can of spray on insulating foam to enclose the gaps. Now that I've done that I can add insulation to the inside eave areas. I have plenty of extra leftover from insulating the underside of our house. The other thing that I need to do very soon is seal up any gaps around door and window trim areas as well as the corners. I want to get it ready for painting soon but I still haven't decided what colors I would like to use so any suggestions are welcome! The recent floods didn't hurt the shed any. Water did rise up and flow underneath the shed and came in one side then went out the other. I went inside while it was raining to see exactly what was happening and saw a steady water flow. The water cleared out fast because of good drainage and everything should be fine. It does bring to mind a couple other tasks that need done either this summer or in the fall. Implement a French drain on the west side of the shed. Grade the ground to create more of a slope to the drainage areas. Build a small "rain" wall from concrete blocks to redirect the water down the aforementioned slope. I'm hesitating to do much soil grading until fall because I would still like the area to be grass and fall is the best time to seed fescue and other cool season grasses. After I finished spraying the foam yesterday I went through and did some clean up inside the garden shed and put many of the leftover pieces of plywood in the rafters. I just can't bring myself to toss out anything that I could potentially use later! Just call me "Dave the pack-rat." Those leftover pieces of wood come in handy so you are most smart to hold on to them. I think a nice blue to complement your home with darker blue or white trim would look great in your yard. I understand the pack-rat venue. I fit that description, too. Your garden shed is looking great, and it's nice to know the floods didn't do damage. Hopefully you can say that about your home and the rest of your property!! 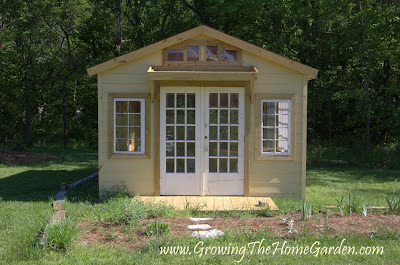 Your GH shed is so beautiful. The wooden front porch is a fancy addition! Smart idea to insulate those little zones to keep the cold air out. You are sooooo close to finishing! I think we're thinking a similar color scheme but it's hard to say for sure without actually seeing what it will look like! We need a salvage store called Pack-rats 'R' Us! The home had very little problems although I have noticed some trim near a gutter that needs nailed back in. Under the house we only had a couple spots of water which should be dry by now. Thanks for the encouraging words! I hope to get a good amount done before July - make it usable for fall propagation and storing of plants over the winter. The shed is really cool and looking great! Like Lynn, I also like your creative idea of front porch. Waiting to see a complete shed. It's almost done. I hope you immediately finish it. 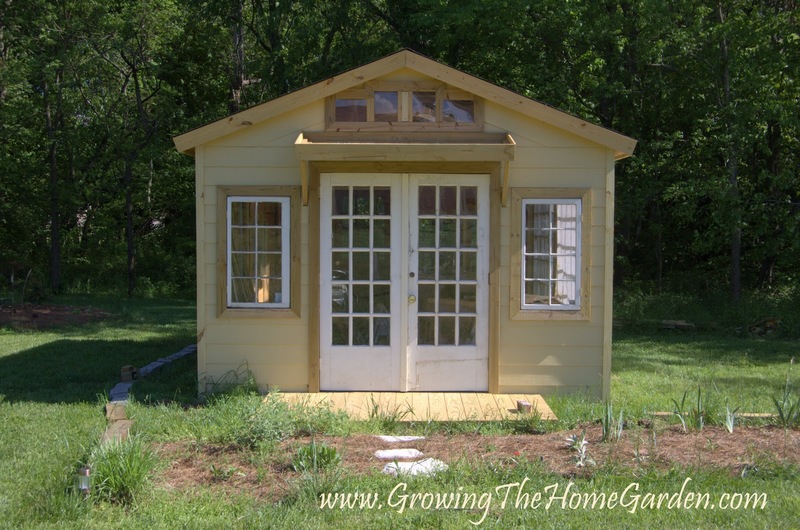 Putting up a shed is a really good idea especially if you have a garden that big.